Позволяет фиксировать активные окна, область окна (регионы), всю доступную часть экрана. ScreenShot Captor поддерживает наиболее популярные форматы графических файлов, такие, как: gif, jpg, tiff, png и другие. Данную программу выделяют следующие особенности: возможность включать комментарии в графические файлы, большое количество режимов сбора данных, у каждого режима своя горячая клавиша и т.д. · Optimized for taking lots of screenshots with minimal intervention – super efficient workflow. · Smart autonaming of files, and ability to embed textual comments in files; automatic image file versioning – with tons of options for automatically naming the file and inserting comments. · Highly configurable to make it work the way you want it to; stays out of your way in the system tray. 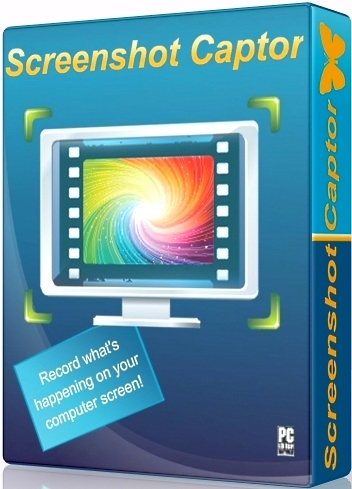 · Lots of capture modes: Multimon, Desktop, Active Window, Region, Windows Object. Each mode has a hotkey for quick access. · Unique Cool Effects, including automatic active window enhancement (see picture below). · Unsurpassed support for 3rd party user configurable tools, including file browsers and image editors; extend the program to do whatever you need b interfacing it with other programs. · Slimline sidebar file browser provides full shell operations, with special quick MoveTo menu. · Optional automatic image file versioning. · Seamless integration with Unicode Image Maker tool. · Autoscroll capture for windows too big for screen, and windows object capture for menus, toolbars, and buttons. · Quick Email sending menu using smtp or mapi (remembers who you sent to so you can send to them again super easy). · Automatically finds boundaries of non-rectangular/themed windows. · Autoscroll capture for windows too big for screen. · Quick PostCapture PopUp Dialog. · Quick Screenshot Emailer Menu.